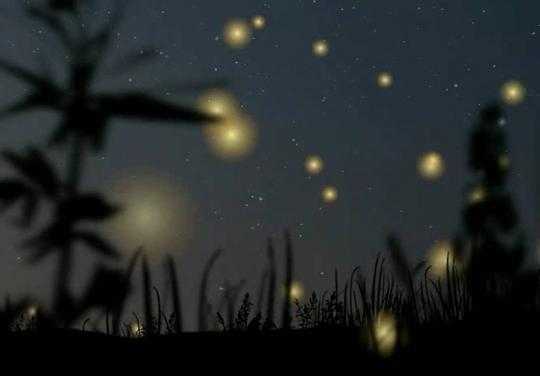 Fireflies. Also known as lightning bugs. There is something in these twinkling insects that fascinates us. And kids, or the kid in us, wants to catch them. Maybe we think that if we capture them, we will hold magic in our hands. Catching fireflies has become a summer tradition for my children for the past few years. My son had his container with perforated lid for catching fireflies, prepared way back in February (late winter) this year. He even labeled his jar with a hand drawn picture of a firefly. When June rolled by and there were still no fireflies, he became impatient. He asked me when will the fireflies come. I jokingly told him that maybe all the fireflies migrated out of Iowa, since they learned that there is this boy who wants to catch them. When we came back from our California visit on July 4th (we flew back home on Independence Day), my son got very excited when he looked outside our window and saw glittering bugs hovering above our lawn. Fireflies! In fact, he was more excited to see the fireflies than the fireworks that were firing in the sky. My son hurriedly took his jar and ran outside. I also went outside to enjoy the summer’s breeze, and shoot some hoops in our driveway basketball goal, while my son catches fireflies. Though there were other bugs, aside lightning bugs, that hovered and buzzed in our ears and feasted on our arms and legs. We did not catch those bugs -we swatted them. While we were outside, our nearby neighbor had a “private” fireworks show in his yard. We did not need to go very far, just in our driveway, to watch the fireworks. Yes, it may pale from comparison to the fireworks show in New York, but I thought it was entertaining enough. My daughter also came out, not to catch fireflies, but to watch our neighbor’s fireworks display. Perhaps she was past the fascination of catching fireflies. My son proudly showed me his jar with a few fireflies that he caught. He placed some blades of grass inside the jar, and asked me if fireflies eat grass. I told him, I don’t know what fireflies eat that make them glow. Maybe fire? Or sulfur? Or kerosene? But I told him that even if we feed them, they will not last very long in his jar. The stunning fireworks sparkle for few moment, but fade in the dark. The alluring fireflies flicker, and then grow dim. This beautiful summer will also soon disappear, as well as all the fireflies. And that is true with everything in life. I know not long from now my son’s childhood innocence will wane and he will be off to chasing other fancies. My kids will soon be going to college, and to their own lives, pursuing their own dreams, and we will be left with an “empty nest.” I also know that my life’s summer will soon (I hope not too soon!) fade into autumn, and my strength will decline, and I will not be able to shoot hoops anymore or chase fireflies. But for one magical night, I soaked it all in, while it lasted. And now I hold them in my memory forever………. or at least until my memory fails me too. As for the captured fireflies? My son set them free into the fleeting summer’s night. quite nostalgic post about fireflies and on how you view it through life..